The civilization of Egypt developed largely independent of other civilizations that were beginning to emerge at the time. The origins of Egypt can be traced to 2900 B.C. (and possibly even farther back but for the purposes of this page we will focus on the Dynastic Periods and not the Pre History of Egypt). The Egyptian Civilization began along the Nile River, this river, as are all rivers, would be vital to the development of agriculture, and various other needs that civilizations need in order to survive. People have lived in the Nile River Valley since before 5000 BC, however, there remained two areas, the Nile Valley, which became known as Upper Egypt, and the Nile Delta or the mouth of the River, which was known as Lower Egypt. Egypt did not become great until these two lands were united by a single king (pharaoh). The Egyptian Civilization had 3 distinct periods or Kingdoms, as well as "2" Intermediate Periods (which are recognized as periods of either decline, or conflict, or both). There is the Old Kingdom (2900 B.C.-2200 B.C. ), which is generally recognized as the 'height' of Egyptian Civilization as well as the formation of the civilization itself. The Old Kingdom, is followed by the First Intermediate Period (2200 B.C.-2050 B.C.). There is a slow recovery, and then comes the Middle Kingdom (2050 B.C.-1780s B.C.). The civilization returns to somewhat to what it was, but never truly gets back to what it used to be. The Second Intermediate Period (1780s-1570s B.C.) is a period of decline, disunity, and chaos. This Second Intermediate Period also marks the first time that Egypt comes under attack from foreign nations, and parts of Egypt are conquered! The New Kingdom (1570s B.C.-1200 B.C.) is a return somewhat to what Egypt used to be, however, by 1200 B.C. they never would return to what they were as Egypt became to attractive to invaders. However, their acomplishments remain to this day. The Egyptians have built many ancient temples, pyramids, and various other structures that still stand to this very day. They created impressive paintings and sculpture, and they even made studies of the planets and the stars and invented a 365-day calendar. The accurate, and uncanny precision in which the Pyramids and Sphinx, and temples were built show that the Egyptians were skilled in both mathematics and engineering. 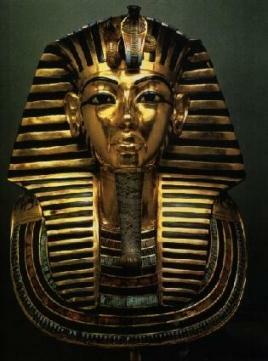 The Egyptians also contributed to medicine by developing new ideas for medicine and surgery. How did it begin, was it Narmer (aka Menes), or The Scorpion King? This is a question of great debate mostly because of recent discoveries that have been made by archaeologists. These new discoveries either fall in place to the already accepted theories or challenge them entirely! The current accepted belief of how The Dynastic Period started has it's roots in the pre history of Egypt, the time when Upper Egypt, and Lower Egypt were seperate kingdoms. The belief is that around 2900 BC, a ruler of Upper Egypt, known as Narmer (we know this from the Narmer pallettes, which tell of this), or Menes, conquered the Nile Delta and Lower Egypt and united Upper and Lower Egypt into one nation. He would establish Memphis (near present day Cairo, which is the current capital of modern Egypt) as his capital, and he started the first Egyptian Dynasty (a line of rulers in the same family, who came to be known as Pharaohs). The new theory that has emerged is that a different man, started it all, and that man is known as The Scorpion King (the real one, NOT the one in the The Mummy Returns, or the Scorpion King, this is a King that actually did exsist to the surprise of many). His name might have been Scorpion, although in Egyptian it may have been pronounced something like Srqt. In an ancient Upper Egyptian town known as Nekhen, The Falcon, also known as Hierakonpolis, an incomplete fragmented macehead was found and attributed to King Scorpion. This is very important because maceheads were sybolic of Kingly power. The macehead was also shown as a weapon in relief carvings that depicted the King using the macehead to smote the enemies of Egypt. The macehead of King Scorpion itself depicts a King or some high official, in full ritual dress, including a bull's tail (representing power) hanging from his belt. There is also a multi-petalled rosette or star which at this time, was used to identify Egyptian Kings (in near by neighboring Sumer it signified Divinity), it was shown in front of his face, as well as a Scorpion sign, thereby proclaiming him as Srqt, or Scorpion. Also on the macehead are Scorpions high officers or officials who are shown carrying standards on which symbols are displayed showing the different areas which Egypt was divided into. If these are interpreted correctly as regional standards, then there are more on the Scorpion macehead than on the Narmer palette. Also, on the macehead, Scorpion is shown performing a ceremony using a hoe. This might mean that he is opening the irrigation dykes to begin the flooding of the fields, or perhaps he might even be cutting the first furrow for a temple or even signifying the rebuilding of a city, beginning a foundation ritual that was a Kingly prerogative in Egypt. There is a decorative freeze at the top of the macehead that depicts lapwing birds hanging from their necks from vertical standards. In heiroglyphics these rekhyts have been interpreted as representing the common people of Egypt, and their fate seems to be that they were conquered by King Scorpion. Some authorities have interpreted the rekhyt symbol as later representing the Egyptian population, whereas in pre dynastic history they referred to foreigners or non-Egyptian instead. This means that the Scorpion Macehead and the Narmer Palette might represent these rulers or ruler to having successfully defeated foreigners from the west Delta. A four-chambered tomb was found at Abydos (B50), and has been speculated as the tomb of King Scorpion himself, however, there has been no conclusive evidence to prove that this is so. However, at Abydos there has been tombs found that are of several First Dynasty kingsand some preceding dynasty kings, designated as Dynasty 0. Some scholars believe that King Scorpion may not have existed, they believe that it might have been just a title and perhaps the Scorpion sign did not signify the personage's name at all. Scorpion may have come from the royal house of Hierakonpolis, rather than from a region or city called This, which was the origin city of the Thinite dynasty from whence came his later successor Narmer, the King Catfish. Perhaps It could be that when Scorpions reign ended, This assumed an uncontested position as sovereign of Egypt. Narmer may have been the first king who actually reigned unchallenged throughout the country. Based upon Scorpions apparent connection with Hierakonpolis and from the stylistic similarities between his macehead and the palette and macehead attributed to Narmer, the two rulers may well have been close contemporaries. 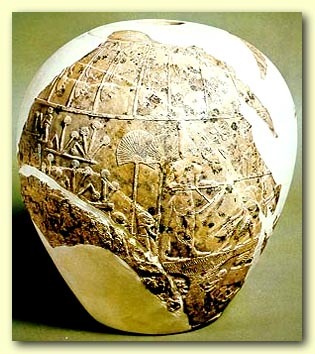 The only other evidence that Scorpion exsisted comes from serekhs found on vases. Serekhs were enclosing devices on which the names of Kings were written. A serekh of a Scorpion has been found on a wine jar from Minshat Abu Amar, this inscription has also been interpreted as being that of "Aha" , who was later a First Dynasty King, who just might have been the same king known to Manetho as Menes. There have been other serekhs found, however, these have not been conclusively interpreted yet either. Maybe when more conclusive evidence is found, we will discover a whole new period of Egypt. I WILL BE ADDING MUCH MORE SOON!!! >>There were periods after this: an Islamic Period, and French, and British Occupations, however, I might add those at a later date!! was a primordial Egyptian God, whose name means "the hidden one", was originally a God of the wind and ruler of the air. During the 11th Dynasty (2133-2000 BC) he became the powerful sun-god of the city Thebes, and was worshipped as Amun-Re. He would later become the the supreme god throughout the land and the King of the Gods. Amun's symbol is the ram. He is portrayed as a ram, as a man with a ram's head, or with a beard and a feathered crown. Temples dedicated to him are situated as Karnak and Deir-el-Bahari (near Luxor). The ancient Egyptians would have called him lenpw (Yinepu). The funerary deity of Egypt, the meaning of the name is unknown, some say it means "Royal Child" while others say it means "to putrefy". He was known as the Lord of The Dead before Osiris, and would later come to be known as the son of Osiris. Anubis is often represented as either a jackal, a wild dog, or even a hybrid of both. The deep black color of Anubis coat does not reflect it's coat color but it represents Anubis as the funerary deity. Anubis is an ancient deity, he is depicted on the oldest mastabas of the Old Kingdom, and have prayers dedicated to him. He is also mentioned in the Pyramid Texts in his most celebrated role of being a guardian and protector of the dead. Anubis is depicted most often as a man with the head of a black jackal, with pointed ears. He is also represented by a full black jackal wearing ribbons and holding a flagellum in the crook of its arm. Very rarely is he ever shown fully human, though there are some cases (such as in the temple of Ramesses II of Abydos) of this. Perhaps the most famous representation of Anubis, the gold-gilded wooden jackal found in the tomb of Tutankhamen, was doubtlessly placed there as a protector of the dead and guardian of the tomb. Anubis's parentage remains a mystery as there are conflicting texts, and I believe that just how Anubis started out as the God of the Dead, and then the title was given to Osiris, and Osiris was then stated to be Anubis's father, I believe that the history of this god may have been changed to reflect that. Egyptian Priets often wore the mask of the jackal as they were embalming the dead. Anubis was primarily worshipped in Cynopolis (Upper Egypt) as this was the center of the cult, however, he was worshipped throughout Egypt as well. this was the name of the solor disc, and it was originally a manifestation of the sun god, Aten (Aton), and became the only true sun god during the reign of Pharaoh Amenhotep IV (1367-1350 BC). The other sund gods (Re, Atum) lost much of their power during this period. It is often stated that Amenhotep, who later assumed the name Akhenaten, attempted to establish a monotheistic cult with Aten as the sole deity and that after his death Egypt returned to polytheism. However, Akhenaten held other deities in reverence too, and his Atenism was not entirely monotheism. He did build the city Akhetaten (modern Tel el-Amarna) and erected a huge Aten temple at Karnak, but the city was abandoned after his death and the temple of Aten was destroyed by his successors. Aten was depicted as a solor discwith rays ending in hands holding the ankhsymbols or hands of blessing over the king and his family. It was also shown as a winged sun disc. The main sanctuaries of worship of Aten were in Thebes, Akhetaten, and Heliopolis. A cat-headed Egyptian goddess, Bastet was originally a solar deity until the arrival of Greek influence when she became a lunar goddess when the Greeks associated her with their Artemis. She was commonly paired with Sakhmet, the lion-headed goddess of Memphis, Wadjet, and Hathor. Bastet was the "Daughter of Ra", a designation that placed her in the same ranks as such goddesses as Maat and Tefnut. Additionally, Bastet was one of the "Eyes of Ra", the title of an "avenger" god who is sent out specifically to lay waste to the enemies of Egypt and her gods. The cult of Bastet was centered in Bubastis (located in the Delta region, near modern day Zagazig). She is depicted most commonly as a woman with the head of a domesticated or wild cat or lion, or as a cat itself. This was the femine goddess in ancient Egypt, Hathor was a pre-Dynastic goddess who gained enormous popularity early on. Her name is translated as "House of Horus", which may be a reference to her as the embodiment of the sky in her role of the Celestial Cow, being that which surrounds the decidedly sky-oriented hawk-deity, Horus, when he takes wing. If Horus was the god associated with the living king, Hathor was the god associated with the living queen. In earlier periods she was most often depicted as a full cow with the sundisk between her horns or as a slender woman wearing the horns-and-a-sundisk headdress (which may or may not have a uraeus upon it). She was also shown as a hippopotamus, a falcon, a cobra, or a lioness, however these were not as frequent as the woman or the cow. While there are some depictions of Hathor as a woman with a cow's head, this is mainly found only in the later periods. Her cult flourished in Ta-Netjer ("Land of God" -- modern day Dendera) in Upper Egypt and her priests included both men and women, many of whom were dancers, singers, or musicians as the arts fell under Hathor's domain. Priests of Hathor were also oracles and midwives, and people could go to some temples of Hathor to have their dreams interpreted by her priests. Hathor's protection was invoked over children and pregnant women. *These are some of the more important Gods and Goddesses, however, the Egyptians worshipped many other gods!